Further locust control is underway in the Upper Hunter as breeding begins. Hunter Local Land Services (HLLS) has issued chemical control on 16 properties in the region after landholders alerted HLLS of banding Australian Plague Locusts. 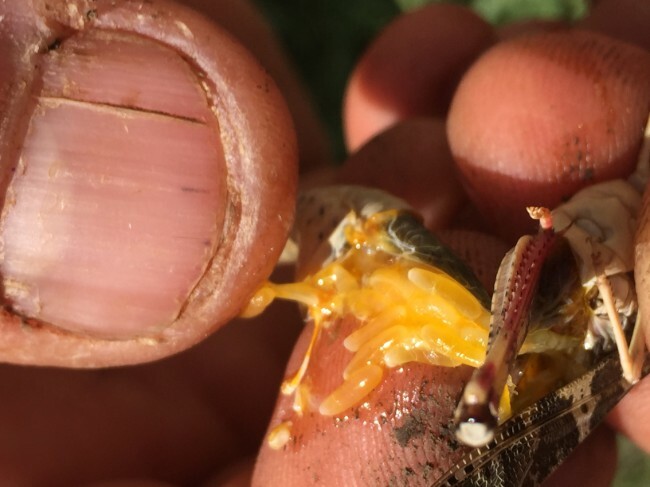 Recent rain has been welcome relief for landholders and producers, but it has provided the perfect conditions for the locusts who are already in the area to band and breed. Banding means locusts come together to feed on the ground as a group, before they prepare to fly to a nesting location and lay eggs. Invasive Species Team Leader Luke Booth said landholders need to be keeping a close eye on the situation. “When they are banding, this is the only stage where these locusts can be sprayed, as once they are on the wing, it is too late,” said Luke. “We can supply landholders with chemicals to control banding locusts, and are already working with a number of property owners right now. “If you suspect locusts are banding on your property, it is important you get in touch with your nearest biosecurity officer as soon as possible. Hunter Local Land Services has had a strong response from producers and the wider community, reporting locust sightings this year. “When locusts were first reported in summer, we received hundreds of reports from the community and were able to map the movements of the locusts in the Upper Hunter,” said Luke. In the autumn eggs are often laid in bare soil, frequently on clay pans or hard ground along tracks and fences. Adults of the Australian plague locust can be readily distinguished from other species by the large dark spot on the tip of the hindwings and distinctive scarlet hindleg shanks. Adult body colour is variable and can be grey, brown or green. Adult males measure 25-30 mm long while females are 30-42 mm long. If you suspect Australian Plague Locusts are banding on your property, please call 1300 795 299 to speak to your nearest Hunter Local Land Services Biosecurity Officer.